The new design also incorporates a lighthouse and a pine cone. 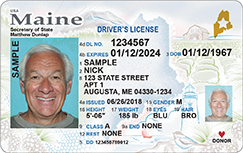 AUGUSTA — Maine’s driver’s licenses and identification cards will have a new look when residents do their next renewals. Secretary of State Matthew Dunlap announced the change Monday. He says the new design will feature an outline of the state and picture of a white pine cone and tassel, which is the state tree and flower. There will also be a picture of the state bird, the chickadee, and images of other beloved Maine scenes, such as a lighthouse and sunrise. The state’s official credentials were last updated in 2010, when the Bureau of Motor Vehicles adopted the current “moose and mountain” design. Dunlap says current licenses and ID cards will remain valid until their expiration date, and the new design will be phased in this spring.